The latest Destiny news and rumors reveal that the beta for Destiny is right around the corner and scheduled to open in July. As you may know, Bungie has been teasing gamers and plans on announcing more details about the beta at this years E3 (the game is also going to be playable there). Many fans are predicting a July 7th release as Bungie is obsessed with the Number 7 (7/7/2014). 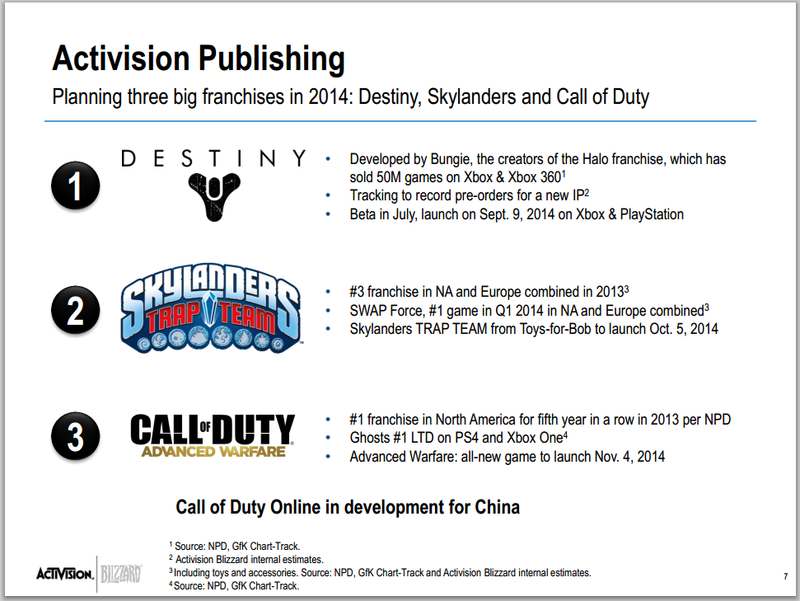 The image below comes from an Activision Financial Q&A presentation. Source here. We well just have to wait till E3 for now to get the official details. Unless Bungie decides to follow the recently popular trend of early acknowledgments and confirmations because of leaks (Assassins Creed, Call of Duty, etc… have all exercised this recently). It is still unknown how much earlier Playstation (PS3 and PS4) users will be able to play the beta. This entry was posted in Destiny 1 and tagged Bungie, Destiny, Destiny Beta, Destiny Beta Date, gaming, video games by Chief Canuck. Bookmark the permalink. Reblogged this on Moral Shock.